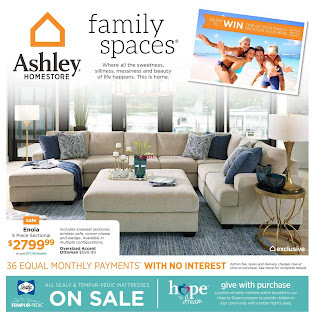 Ashley HomeStore Canada Flyer February 1 - 14, 2018 - sale Enola 4 Piece Sectional $2799.99 or just $77.78/month Includes loveseat sectional, armless sofa, corner chaise and wedge. Available in multiple configurations. Oversized Accent Ottoman $599.99. 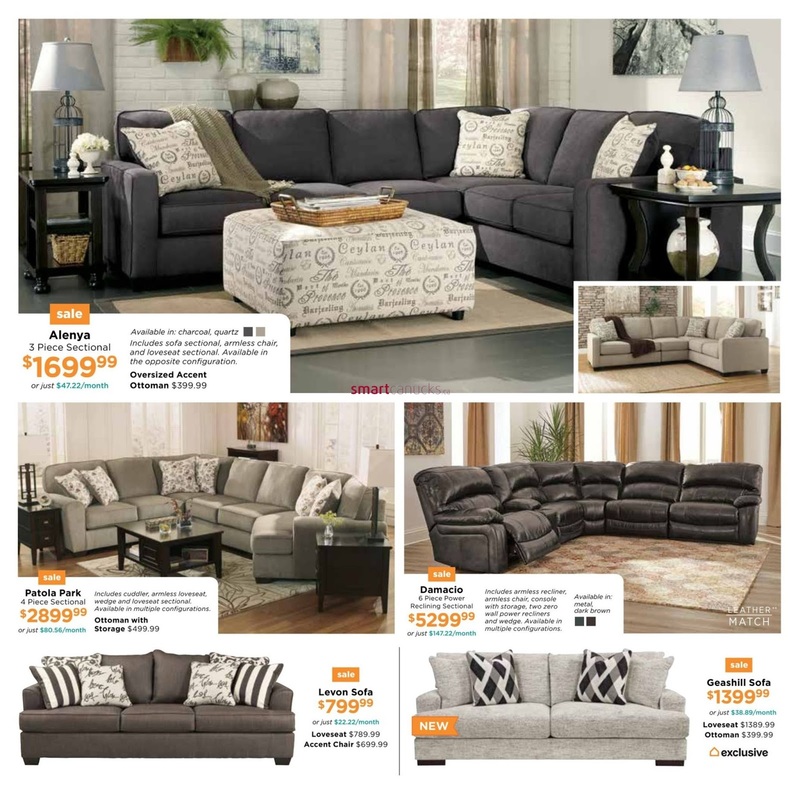 Ashley HomeStore Canada Flyer Sale Alenya 3 Piece Sectional $1699.99 Or just $47.22/month Available in: charcoal, quartz EN Includes sofa sectional, armless chair, and loveseat sectional. Available in the opposite configuration. Oversized Accent Ottoman $399.99. Sale Patola Park 4 Piece Sectional $2899.99 or just $80.56/month includes euddler, armless loveseat, wedge and loveseat sectional. Available in multiple configurations. Ottoman with Storage $499.99. 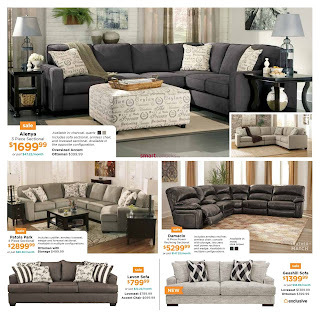 Sale Damacio 6 Piece Power Reclining Sectional $5299.99 or just $147.22/month Includes armless recliner, armless chair, console with storage, two zero wall power recliners and wedge. Available in multiple configurations Available in: metal, dark brown. 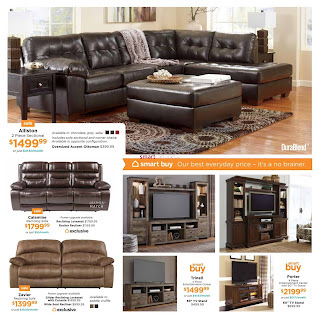 Sale Geashill Sofa $1399.99 or just $38.89/month is Loveseat $1389.99 Ottoman $399.99 exclusive. Alliston 2 Piece Sectional $1499.99 or just $41.67/month Available in: chocolate, grey, salsa Includes sofa sectional and corner chaise. Available in opposite configuration. Oversized Accent Ottoman $399.99. Sale Calamine Reclining Sofa $1799.99 or just $50/month Power upgrade available. 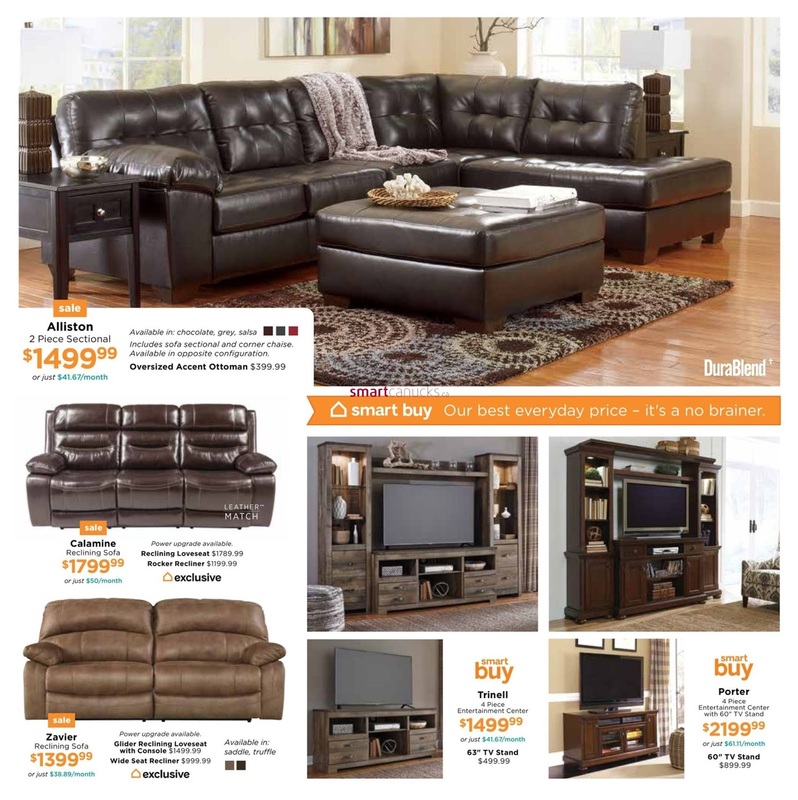 Reclining Loveseat $1789.99 Rocker Recliner $1199.99 exclusive. Includes round extension Trudell table and four chairs. 5 Piece Dining $1199.99 or just $33.33/month Server $999.99 Upholstered Chair $249.99 5 Piece Dining with Rectangular Table $1199.99. Ashley HomeStore Flyer Sale Alexee 5 Piece Dining $999.99 or just $27.78/month Includes rectangular extension table and four chairs. Server $749.99. Sale Wendota 5 Piece Dining $1599.99 or just $44.44/month Includes rectangular table and four chairs. Bench $699.99 Server $899.99. 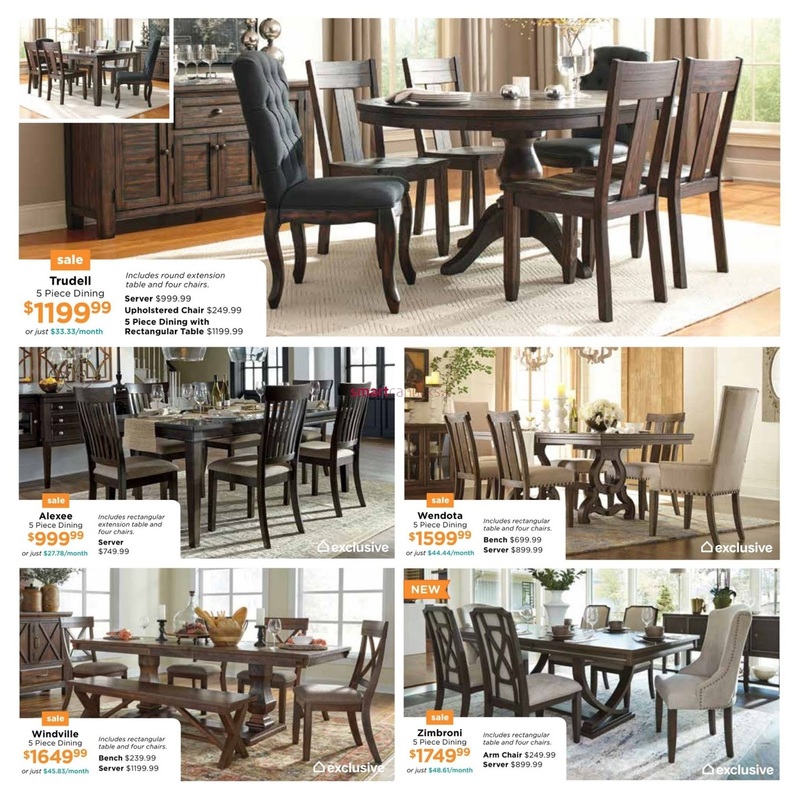 Sale Zimbroni 5 Piece Dining $1749.99 or just $48.61/month Includes rectangular table and four chairs. Arm Chair $249.99 Server $899.99.